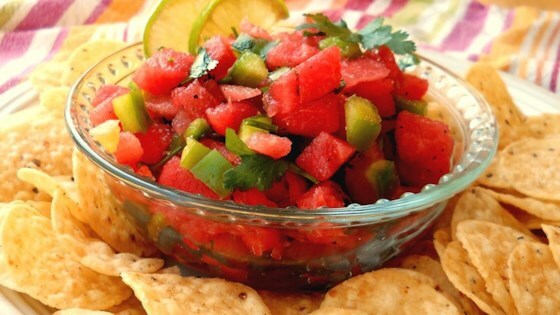 "Juicy watermelon replaces tomatoes in this salsa that's simultaneously cool and spicy hot -- perfect for a summer barbeque. Serve it with tortilla chips, or use it as a topping for grilled chicken or fish." oh my i guess i did not know what to expect. But this was not good!! This is a huge hit wherever I take it, and I have memorized the recipe since I am asked for it so much. ALL SKEPTICS HAVE LOVED THIS!